On Monday morning, I heard on the BBC news brought to me by WNYC that a report from England, calledT he Foresight Report on Food and Farming Futures, had been released indicating that unless we change our ways we were not going to have enough food to support the growing population of the world for the next 20 years. The Foresight Report indicated that the food production system will need to be radically changed, not just to produce more food but to produce it sustainably. Ok not really news — more like the substantiation of what we know. I love this quote. If I could I would plaster it everywhere. Turn it into single for Justin Beeber. I am not the fastest blogger out there. Even in this case, I’m “reporting” on something I heard two days ago. But as I’ve been thinking about writing this blog, I have been even more struck by the US media silence. I checked the usual suspects, the NY Times, The Washington Post, ABC news – even NPR. Of course it wasn’t mentioned in the president’s state of the union address. But couldn’t Obama have used this info to drive home the point that energy, food and environment are actually one issue? And it wasn’t mentioned in the president’s state of the union address. Couldn’t Obama have used this info to drive home the point that energy, food and environment are actually one issue? I started to wonder, is report not valid? Is it somehow a hoax. I checked snoops.com – it didn’t show up there either. Ironically, every time a new report comes out talking about how this food or that food will cause cancer, stop diabetes, increase childhood obesity, decrease varicose veins or heart disease, make you age slower etc. it’s plastered all over everything. But the fact that in 40 years, a percentage of the world will not have food and the mainstream media doesn’t say a peep. When I started to peruse other bloggers, I discovered Ground Reality. Apparently the report was all over the media somewhere but Ground Reality points, the information is a reiteration of what we know instead of solid steps on how to change things. I agree. Although to my point earlier, this kind of report is the kind of lynch pin pundits usually gravitate to, to give a bit of credibility to their agenda. Maybe it’s because the community recognized that the report is in part an attempt to give some justification to GM practices. As Ground Reality author, Devinder Sharma so eloquently stated. So in other word, this report was just regular old diversionary marketing play for Prof. Beddington. Companies sponsor self-serving research in the form of white papers all the time. Maybe so, but what does it say that the American Media didn’t pick it up? That ABC and Fox news were so savvy they sniffed out the biased foundation of the research. Or that our industrial farm complex is so strong in the US that we don’t need reports to legitimize industrial farms stronghold on things. Take what happened yesterday. The power of the GM industry was also in the news this week. The government agreed to deregulate alfalfa: My friends at the Cornocopia Institute reported that yesterday USDA Secretary Tom Vilsack announced that the agency will fully deregulate Monsanto’s controversial genetically engineered alfalfa. Here’s the problem with genetically engineered alfalfa. Alfalfa is pollinated by bees and other insects and has a pollination radius of five miles. If a bee cross-pollinates organic or just plain old conventional alfalfa with the genetically modified (GM) version owned by Monsanto, Monsanto gets ugly. And they don’t go after the bees who are doing their job and propagating – but they go after the victim farmer who didn’t want Monsanto GM alfalfa mixed in with their crop in any case. According to the Cornocopia Institute planting of GE-alfalfa could begin this spring. They report that Forage Genetics (owned by Land O’ Lakes) has millions of pounds of Monsanto’s seed in storage. I guess the only thing I can do is go on a Land O’Lakes boycott — not that I buy very many of their products anyway. If local means within 200 miles, then the Hudson Valley treasure Love Bites, a mere 97 miles north of my apartment, could be defined as a local hang out. I wish practicality matched my linguistic game because Love Bites was awesome. We stopped there on our way upstate on Saturday morning and had a delicious and primarily local, mostly organic, and even a bit vegan meal. Sounds a lot like my life these days. 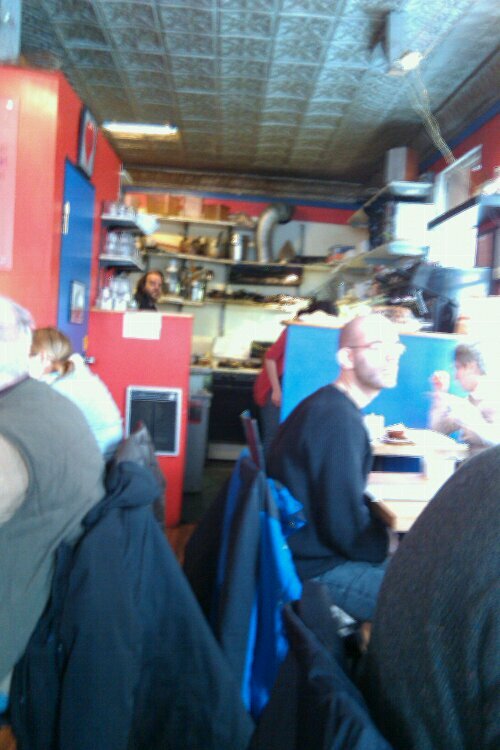 Opened about three years ago, the cafe is little bite of a restaurant; it only has two rows of tables flanking a thin aisle. When we walked in, the red walls with royal blue trim and beautiful tin ceiling spruced up with a coat of silver felt warm and cozy and inviting. It was crowded with interesting looking people but luckily there was a table for four by the door. As we sat down, I saw that two tables down a woman was about to dig into a square plate heaping with french toast. It looked delicious. 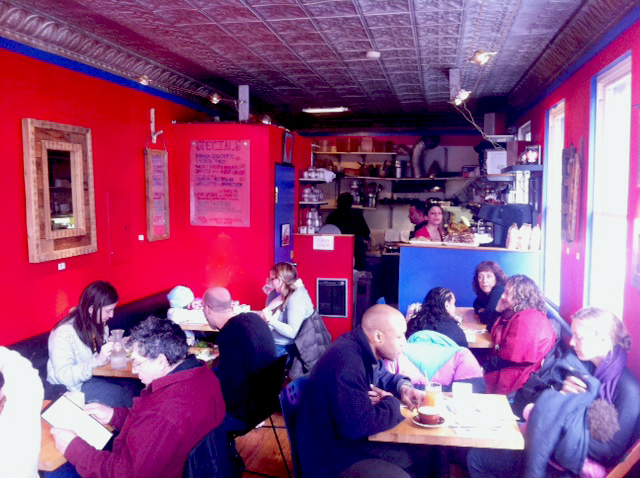 “Maybe we found a place that beats brunch at Kitchenette?” I whispered to the kids as we opened our menus. We love Kitchenette’s brunch and with its quirky menu and overall look, Love Bites felt to us a bit like Kitchenette’s country cousin. The reviews online suggested we order off the specials. But it was a tough choice. There was a gnocchi in cream on the special that looked scrumptous. And the main menu boasted a decadent and intriguing Carrot-Coconut French Toast which is actually french toast created from carrot cake. The kids ordered the french toast off the special board. 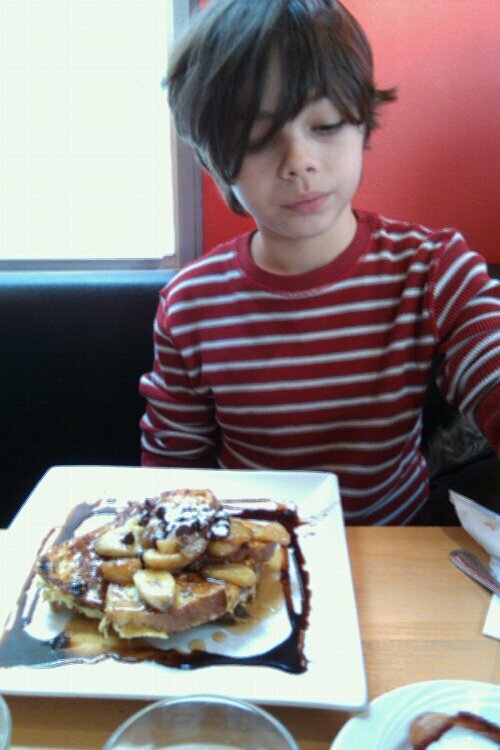 B got his the way the special was intended, Chocolate banana french toast . Z left out the chocolate.John ordered the Zucchini -n-Sweet corn fritters with two poached eggs. I also ordered off the special board — the Crimini-Parmegian omelet with a side of sautéed spinach and a cup of regular coffee. The coffee came in a pretty light blue cup. It was shaped more like a tea-cup but had the heft and size of mug. It felt good in my hand. I could tell by the swirl of light brown foam on the top that it was clearly brewed individually. Plus it arrived with a small metal pitcher of steamed milk on the side. It was perfect. Little details like that are part of what make this sliver of a cafe so delicious. The coffee was roasted locally. The bacon was from a local farm. And as I overheard th waitress say , the bread was organic sourdough. According to the pamphlet/menu by the door, the cafe is owned by three partners — Mark, Juan and Maria. Juan it turned out was on the grill whipping out beautiful omelettes and plates of french toast with amazing speed and style. Mark, who seemed to be overseeing everything said that they started up about three years ago. None of them were officially trained but everyone had worked in restaurants. Juan, answered a few questions between plating food. From the Dashi on the special board to the Smoked Chicken Panini there were clearly nods to many regional and ethnic types of foods on the menu . 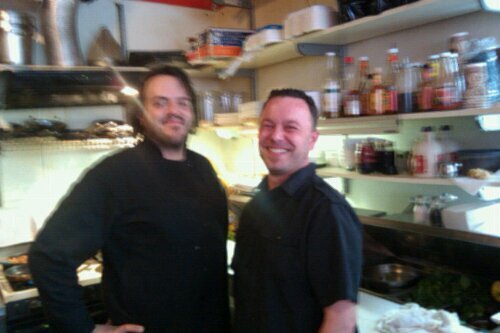 So I asked if they were influenced by any school of cooking. He said that not they cook from inspiration not from books. Johns eggs were poached perfectly and looked lovely on top of their fritter. The fritters had a bit of a bite of baking soda bit in them. This was our least favorite plate. My omelet was perfect. 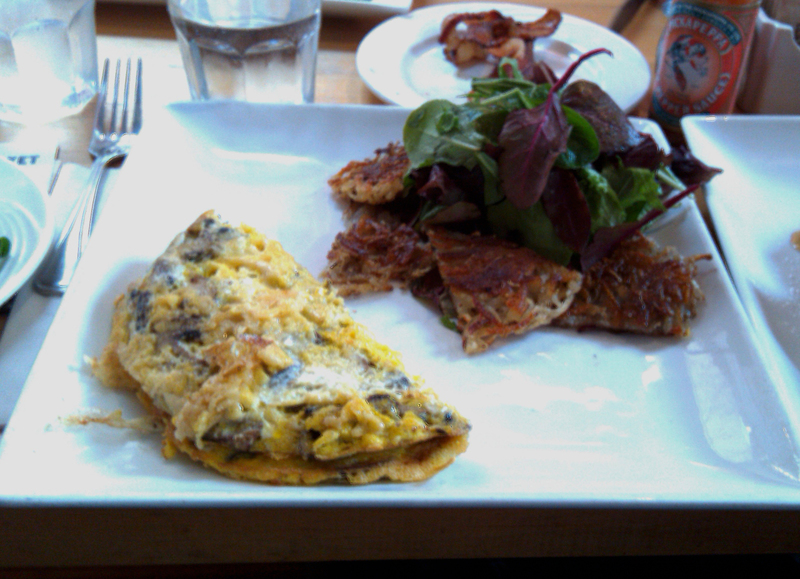 It came with a light potato pancake cut into triangles – a nice touch. The greens in the side salad were beautiful — dark with stripes of purple — honestly the best salad greens I’ve had all winter. Mark, the owner, said they came from a greenhouse somewhere out toward Pennsylvania. The spinach was also good. It was bright and fresh sautéed with just the right amount of good olive oil. The kids french toast was decadent and delicious. The waitress was surprised that Z finished his plate – the portions were not small by any means. The menu boasted many vegan options. I’ve just finished Mark Bittmans’ Food Matters. His belief is that the best way to live more sustainably is to eat vegan for most of the day, and then allow yourself to eat whatever you like for dinner. I asked whether Love Bite’s vegan options was political choice. Mark said that when they decided to open the café, they asked the local community what they needed. What they heard was that the town needed a restaurant with more vegan options. I like the integration of vegan into a traditional menu. I agree with Bittman, that eating more vegan and vegetarian are clearly an important part of rethinking our daily menu. But stigmatizing vegan as weird and out there is messed up. Although Love Bites is probably a bit hippy for the general public, it’s also a lot foodie. And merging those two headsets can only be good. And the way it’s done at Love Bites was inspiring and even better, felt doable. Overall, with its interesting food choices, locavore spin and great ambiance, Love Bite is definitely one of my new favorites — even if it’s not local enough to walk to . If you’re in Saugerties, stop by Lucky ‘s Chocolates a few doors down from Love Bites. Yummy small batch, fair trade and organic chocolates in fun shapes — chocolate frog etc. Our favorites — monster sized peanut butter cups, chocolate covered potato chips and ice cream in the summer. I first read about Fleisher’s Grass Fed & Organic Meats last summer? I was surfing around looking for places to buy grass-fed beef when it came up. Even though they were about a hundred miles upstate, I was curious. And a little bit intimidated. The Fleischer’s website is everything that makes me feel doltish about my fumbling attempts to eat in a way that promotes sustainability. 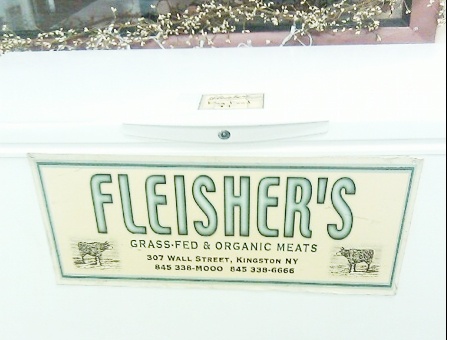 At Fleisher’s it seems like they have the whole thing down pat – affordable, available, grass-fed organic meat. Their website makes the whole prospect of eating with a conscience look so easy. Of course, I wanted to visit them right away. But there was something that seemed off about driving an hour and half just to buy a chicken. That just couldn’t be green. They do deliver to NY, but the $12 service charge felt expensive. So, I had been waiting for a time when we were in the neighborhood. Fleisher’s was created to be a local butcher shop that only sold only premium products. The site said that they bought from local farmers who have raised their animals on a primarily grass-based diet or according to organic standards. The combination of grass fed and local makes the meat more sustainable. I’m already convinced that eating in this way is the right choice, but still I like to remember the facts behind my convictions once in a while. After driving in circles in downtown Kingston, we finally found the store. We parked next to a snowbank and walked past a fancy real estate agency to the main street. I noticed a boutique that sold organic kids cloths and toys. But I quickly realized that was the only bit of eco-chic ambiance, I was going to get out of Kingston. Most of the main street was pretty dead. The butcher shop was pretty much that – a butcher shop. It’s not fancy or slick. In the front, by the window, there were local and organic beans and soba noodles on some wooden tables. The beans were not cheap, $5.99 /lb but I scooped them up. As I approached the butcher counter, a tall, bulky boy asked if he could help me. I was overwhelmed, there were chickens and tons of kinds of beef and lamb. Nothing was expensive by grass fed standards. The chicken was a bit more than I normally pay ($3.49 as compared to $2.99), but for fifty cents I thought it was worth it because I believed it was pasture raised. The Murray’s Chicken I’ve been eating is humanely raised but lives in a barn. I think of it as industrial farming light. Unfortunately, after digging a little deeper, I found that Fleisher’s chicken was supplied by Pristine Cuisine which is organic but not pasture raised. Oh well. I guess $3.49 was too good a price to hope for for pastured chicken which normally in the farmer’s markets runs much more. In addition to two chickens, I picked up some ground beef, a roast and a London Broil. While we were shopping, several butchers were slicing and dicing a large animal in the background. “Do you mind if I take pic for my blog?” I asked. Sure, one of the butchers said. They all posed. “Would you like a tour?” he asked me. I looked at the kids and we all nodded. Brian emerged from the pack of butchers. He was a young former musician with a healthy covering of tattoos. He opened the counter next to the cash register and invited us behind the counter. He showed us the freezers with sides of pork belly that would become bacon. 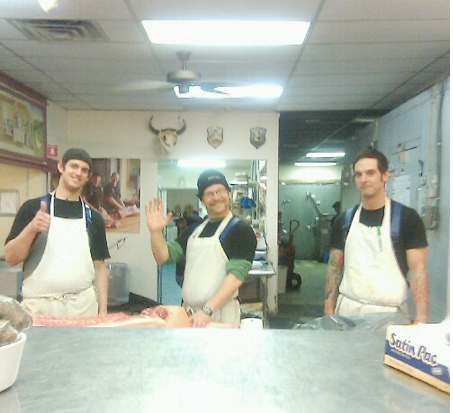 He showed us a big meat grinder where they grind the meat for sausage. He also explained how the leftover bits were used for pet food, so that nothing was wasted. He explained how Josh Appleton came from heritage of butchers — his grandfather was a butcher in Brooklyn — but that he was a former vegan. When he decided to start eating meat, he couldn’t find local, organic or pastured options and thus the idea for Fleisher’s was born. Z was excited by all the big knives and he watched with fascination as they sliced away at a pig. B on the other hand was horrified. He stared in dismay as one of the butcher’s helpers pressed the button and meat came dripping out of the metal grate. Brian was great. He answered all our questions. He also told us that in early spring Fleischer’s would be opening “Grass”, a sustainable luncheonette in the space next door to the butcher shop. He even gave us a package of hot dogs on the house. Grass fed hot dogs are definitely way more expensive than supermarket dogs. Even the Applegate farms brand (again industrial light) from Whole Foods — they only run me about $5 a pack. In comparison, a pack of Fleisher’s dogs cost 13$. But it was sooo easy. And Chinese food (our former Friday night tradition), which costs around 35 bucks on a good day, is certainly no bargain. Plus, Chinese food made from industrially-raised chicken makes a ton of garbage even when I do my paper container trick. I don’t think I will be making hot dogs a weekly meal, but once in a while it’s really worth it to be able to give my kids kid food and still be able to stick to my principles. One part of the Fleisher’s website I really recommend is their Is it Affordable? section where they map out how to serve 4 meals a week to a family of four for under $50. I think they under-estimate how much a family of four eats are a little bit — or maybe I just have two boys — but I still found it useful and worth checking out. If you place an order of over $100, Fleisher’s will deliver to NYC. The delivery charge of $12 initially seemed like a big expense. But after tasting the quality of their meat, I would definitely consider it for times when I’m not in the neighborhood. And for me, I do hop upstate enough that I can see a trip to Fleisher’s as part of my new routine. Every Wednesday, Jessica and Joshua publish The Butcher Blog for Sauveur Magazine where they share links that help us understand what artisanal butchers do and to appreciate where our meat comes from. Sunday morning — after I had already made pancakes for breakfast, I realized that we had run out of maple syrup. I dug around and found a plastic bottle shaped like a toaster waffle in the back of the pantry. “We can use the evil syrup,” I suggested. “Sure,” I shrugged “it’s only once. Why not?” The kids went into tizzy. “Did you hear that?! Mom says we can have the evil syrup.” Z’s friend who had slept over looked at us like we were crazy. 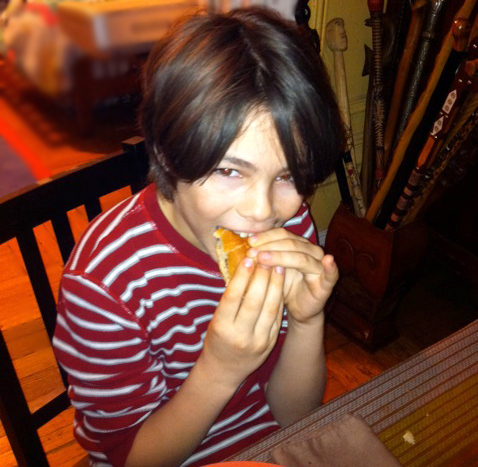 “We don’t usually get to eat this kind of syrup,” Z explained as we all sat down at the table. The tsunami thrill of being invited to partake in the formerly transgressive high fructose corn syrup in it’s purest form started to wane as I handed them the bottle. It was true. The dusty bottle had been in the back of the cabinet for almost ten years. John had brought it into the house back when John’s kids were B and Z’s age; at the time they thought maple syrup was weird. My kids used to call it R and D syrup when they begged to be allowed to try. Ok, I’d be lying to say I wasn’t super pleased. Luckily the pancakes were delicious enough that they didn’t really need syrup. But this is really not a story about syrup. It’s a story about meat. And it starts with the bacon we had along with these pancakes. 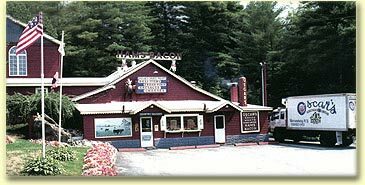 I spotted Oscar’s Adirondack Mountain Smoke House on the way home from skiing at Gore Mountain between Christmas and New Years. I saw the sign as we were headed back to the Thruway and something about the lonely, red house on the hill beckoned me to turn around and make my way up the long driveway to a packed parking lot flanked at it’s entrance with a ceremonial smoke house and a big pink statue of a pig. 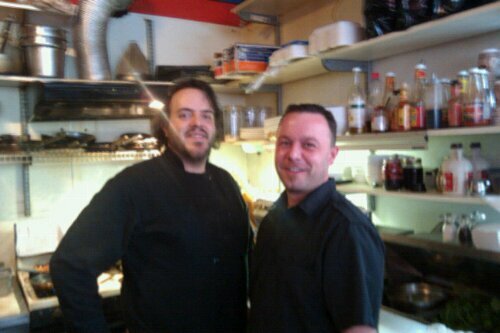 The smoke house is a 45-year-old, family owned business beloved of the local community. According to the web, it closed down after a fire on Labor Day of 2009 reopened in February of last year. Despite it’s slick mail order website the store itself feels like a local mom and pop shop. Inside, on one side there’s a wall of refrigerators for self-serve and a few shelves with some barbeque sauces, condiments and maple syrup. On the Southern end there was a regular butcher shop counter with fresh meat, a deli and a place to purchase more smoked products — bacon of course, but also ham and cheese and turkey and beef. I stood in the middle, between the shiny wall of self-serve refrigerators and the butcher section wondering what I could buy besides the two pig-shaped maple candies I held in my hand. Maybe I was tired from skiing, but I was not at my most articulate. I wanted to ask if the meat was industrially raised but for some reason I was at a loss for words. “Organic?” he finished my sentence. “Really?” I was surprised. We were down the street from a ski resort. For some reason I thought that would generate enough of a clientele that was willing and eager to eat organic and grass-fed meat. “What about your pork?” I asked. I was surprised. I was too tired to ask if these little piggies were weaned too early so that they bit off each other’s tales, as described in Michael Pollan in Omnivour’s Dilemma. Besides that didn’t seem particularly polite. Instead, I bought a few pounds of bacon. It’s wasn’t exactly local since the pork came from Canada — but then again, maybe it was, since we were only a hundred miles from the Canadian border. But I took his word for it being farm raised. Bacon is now a treat in the house. We used to eat it frequently – but since I stopped buying industrially raised bacon, finding and affording it has been more of a challenge. In terms of taste, I would Oscar’s Smokehouse Bacon was ok. I would say the bacon is better than supermarket bacon, but nothing to write home about. A few months ago we picked up a pound of bacon at Dickinson’s Farm Stand in Chelsea Market that was ridiculously good. That bacon tasted as if all other bacon in the world was a photocopy, and the kind we got at Dickinson’s was the original. But the Oscar’s Smokehouse stuff was also about half the price of Dickinson’s. Apparently according to reviews, the ham is amazing. Next time, maybe we’ll try it. New Years Resolution: Veg when out. Happy New Year ‘s everyone. 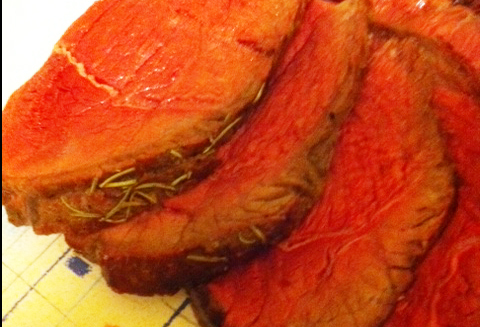 Here in Chez Wannabe-sustainable (aka Caliban’s Kitchen), we rang in the New Year with an amazing roast beef dinner courtesy of Fleischer’s butchers in Kingston, New York. Ironic, since my New Year’s resolution is to cut down on my meat consumption or more exactly stop eating it when I eat out. One of the first things I did when I started my quest to understand what eating with a conscious means was to eliminate our in-house consumption of industrial –farmed red meat and chicken. I stopped buying the bacon you get in the supermarket. I stopped buying the beef you by in the supermarket. I stopped buying chicken that wasn’t humanely farmed. And I’ve spent a lot of time figuring out places to buy local grass-fed beef – hence my pilgrimage to Fleischer’s upstate. But so far, outside of the house, I’ve been a little loosey-goosey about what I eat. My model has been based on the kosher folks I grew up with — kosher in the house but outside, it was shrimp cocktail or bacon and eggs. I truly believe that being a vegetarian is the right thing to do. It’s healthier. It’s better for the world. (And I live with a man who’s been a vegetarian for over 15 years.) But I just haven’t been able to do it. (Or is it that I don’t want to do it?) Maybe it’s a process of moving my actions closer to my convictions. If that’s true, my baby step of a sort, is to go vegetarian when I’m eating outside of the house. That probably means no more tandoori chicken, no more street tacos and no more Szechuan pork from that great Chinese restaurant on 40th. Sigh. But just for clarification, it probably won’t mean no more eating meat at other people’s houses. And it doesn’t mean I am going to make my kids become vegetarians in restaurants – but I will encourage them to stay away from industrial-raised meat. B and I have already been trying to get Z to stop eating so many of those industrial raised hamburgers. Unfortunately, one of his current points of pride is that he can eat more school hamburgers than anyone else in his class. I hope they will follow my example and my baby step will lead to their baby steps. I say baby step but I know it’s not really going to be that easy. Have I mentioned how much I love tandoori chicken? Get ready for some whining.